We’ve lauded praise on Chromebooks before because they’re useful and cheap Looking For A New Laptop? Get A Chromebook Instead! Looking For A New Laptop? Get A Chromebook Instead! Read More – but now Google is coming for your desktop. Today we’ll see if the ASUS Chromebox (starting at $159, but $379 as reviewed) is a competent desktop replacement. At the end of this review, you’ll be able to enter a giveaway for a chance to win this ASUS Chromebox! 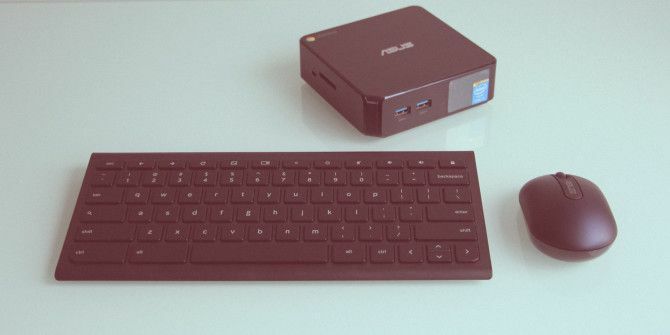 The ASUS Chromebox is a little box that has all the components inside it necessary for a computer. It’s very similar to a Mac Mini in form, so it’s certainly smaller than a conventional desktop tower. To be precise, the dimensions are 4.88 x 4.88 x 1.65 inches and it weighs just 1.3 pounds. The idea behind the creation of the Chromebox is that you can get a desktop set up and running for a relatively low price. Since the a mouse and keyboard are included in the package, all you need to add is a monitor and speakers. While it won’t be your next great gaming rig, it’s more than enough for a simple computer that can access the Internet. There aren’t many Chrome OS-powered desktop devices out there for comparison, but the LG Chromebase ($320) is an all-in-one desktop. There’s also the HP Chromebox ($136), which is roughly the same price and specs as the ASUS Chromebox M004U (the little brother to the model we’re reviewing today). At the same price point, I prefer ASUS over HP mainly because of build quality. The model we’ve reviewed (and will giving away) today is the M075U, available for $369.95. It has a faster processor, more memory than the M004U, a better graphics chip, as well included accessories – but is otherwise physically identical. The packaging of the Chromebox is straightforward. You get the unit, the power cable (with attached power adapter), mouse, keyboard, and some manuals to read through if you’re not sure how to get going. You also get a VESA mount and screws, with which you can mount the Chromebox onto a monitor or TV, raising it off the desktop. Once you have everything unpacked, you just need to connect an HDMI or DisplayPort compatible monitor, and attach some speakers (there isn’t one built-in). The Chromebox supports any USB or Bluetooth keyboard. It has an Ethernet port, but there’s also 802.11n WiFi connectivity built in. A decent number of ports are provided, including an SD card reader, a Kensington lock slot, four total USB 3.0 ports, and a combined headphone/microphone jack. Most of those items are found on the back – the front has two USB ports, and the left side has the Kensington lock slot and the SD card reader. Since this is technically a desktop, ASUS was able to make use of the better cooling setup within the unit and provide desktop-class components rather than laptop-class ones. The M075U model has an impressive 1.7 GHz Intel Core i3 4010U CPU, 4GB of RAM, Intel HD 4400 graphics chip, as well as a 16GB SSD which is standard across all models. Note that if you opted for the cheaper model which is only equipped with 2GB of RAM, it is in fact upgradeable via 4 small screws at the base. I like the design of the Chromebox. It’s small so it doesn’t take up very much space and it’s easy to hide. The ports are nicely placed, but I think it might have been better to situate the SD card reader in the front and the Kensington lock in the back. I assume it’s the tight internal structure that’s restricting their placement. The material used for the outside feels good, but it can leave some fingerprints behind if you handle it much (which you normally shouldn’t besides turning it on). There’s only one indicator light on the power button to indicate whether it’s on. A disk activity indicator would’ve been nice too, and maybe even a network indicator, but those are disappearing nowadays – a lot of Chromebooks don’t have them anymore, and neither do MacBooks. The mouse and keyboard connect to the Chromebox via an include USB receiver dongle. The mouse is very basic, feels a bit cheap, but works well enough. The keyboard is nice: it feels great typing, and uses the Chrome OS keyboard layout – which replaces the Caps Lock button with a search button, and gets rid of the Windows key. However, while the mouse worked great, the keyboard seemed to struggle to establish a reliable connection. It would occasionally connect for a few seconds, but then lose it again. I checked the user guide for troubleshooting instructions, but all it said was to turn it on and it should work with the dongle inserted into a USB port. The keyboard does have a “Connect” button on the back but there were no instructions on how to use it. Both devices need two AA batteries to operate, included with the purchase. Rechargeable batteries would work fine, too. Once you get going, the Chromebox behaves exactly like a Chromebook – Chrome OS is no different. While I can’t comment on the display or sound quality, which will depend upon the monitor and speakers you connect, I can talk about the experience of using a Chromebox in a desktop environment, how it performs, and whether it feels like an adequate solution. Like other Chrome OS devices, the Chromebox runs quiet and cool, although it does have a fan for ventilation. It’s significantly more energy efficient than traditional desktops, and it’s snappy when resuming from sleep. These benefits, plus everything that Chromebooks are generally known for, are easily recognizable on the Chromebox as well. YouTube videos played problem-free in 1080p (the M075U can supposedly handle 4K), web page loads were very quick, page scrolling was exceptional, and the interface was very responsive. If you’ve found Chromebooks to be underpowered at times, the desktop-class components of the Chromebox face no such issues. Ultimately, it is limited by the capabilities of Chrome OS – so it won’t ever be as powerful as a traditional desktop with any of the three major operating systems. Since a lot of common apps now have a Web-based, that certainly doesn’t mean that you can’t be productive with it. If you already have experience with Chrome OS and know how to be productive on it, then you’ll have absolutely no problem with the Chromebox. Is it a good system? Absolutely – but it’s not for everyone. If you need a specific Windows application; if you’re a gamer; or for those requiring heavy number-crunching such as video editing – the Chromebox simply won’t suffice. If all your needs can be taken care of online, a Chromebox is a great desktop replacement. It’s especially good for older family members who will just want to check social media, their email, and read up on the news. It’s a cheap device that is easy and safe to use, and it updates itself automatically. How Do I Win The ASUS Chromebox M075U? Glyph giveaways really should display the winner. Very cool device to have. wow look how diddy it is. I love my big screen monitor, and I hate tablets as the screen is so small. But I do love the space, so this is just amazing. This is the perfect, compact PC to use for surfing the net, things like facebook, skype and games..I would love to win this for my step daughter Jen, whose PC just died. It would make her and me very very happy. "Since this is technically a desktop, ASUS was able to make use of the better cooling setup within the unit and provide desktop-class components rather than laptop-class ones." Actually, no. It uses a mobile/ultrabook CPU/GPU, not a desktop one. I dig it. Would love to play with this thing for a while. Cool. Pick me, pick me! Your next winner!!! Show me the money!!! It would be a dream come true and means more to me than anyone else to win. Starving artist here desperately needs the asus-chromebox to work and eat again. Winner, winnner. Chicken dinner. A life changing experience. Top of my bucket list. Thank you for the awesomeness, the contest, and generosity. Dear Santa: I’ve been nice. My X-Mas wish this year is to win this contest. This is my second comment and sorry for that but here is the thing: this article really got me going and made me want to see it in real life. So I went on hunting for it in downtown Toronto. To my huge surprise, I found it at the Futureshop. It was placed in a place totally unnoticed with the monitor that it was hooked on set on off mode. I put on the monitor and using its mouse and keyboard started to explore it. It worked like a charm just the way I wished it to be. The Chrimebox is cute and surprisingly light in weight. It has two removable screws at its back where you can simply and brilliantly hook it up at the back of your TV with total ease. While I was enjoying my new discovery, a salesman came and asked me if needed help. I asked him to tell me something about it. To my surprise he didn't know much about it and he told me that no one seems to show interest in it. It was then that I felt insulted and I decided to educate him about that beauty using all the infos I got for this article. He got so surprised and called his other two co workers to listen to my lecture. I really sold the product to salesmen lol. One of them asked me that if I work for Asus and I told him no. Before I left, I navigated them to Makeuseof website using the Chromebox , opened this article and adviced them to learn more about it. Yes I love this product and I believe the idea is brilliant. He say "If you have experience with Chrome OS...", I say "Heck, yeah!". That would be the perfect gift for me ! So many of us out there have been rather leery of Chromeboxes but, for all the reasons you've stated in your article, Danny, sounds like this ASUS would be the ideal go-to for finally getting my 80 yr. old mom interested (and several of her very interested girlfriends) in biting and holding on to "the bullet!" She always loses interest real quick and gives up rather easily. Can't say the same for my older aunts, however; they're very computer savvy. please get me this time ..
An i3 is a nice bump for these things. I like full Haswell options instead of Bay Trail. I'd love to win this....love winning things, and this would be a good solution for some of my needs. Would be really nice to connect to your TV and browse the web from your couch. Definitely a want-to-win! This would be ideal to truly get full benefit from my LG Smart TV. (The built in chrome-based browser on the TV does not support up/downloads, and while software updates have been regular it does not support hangouts in Google Plus). The added advantage of this box is that you can also connect it to a projector. Amazing Giveaway , Awesome Prize ! Wish to be counted in. Fingers Crossed !! This seems to be something the grandsons would love to have,me too! The wife would love this, no doubt. Have followed and tweeted on Twitter, but no corresponding extra entry. Seen many +ve reviews. Would love to win it. For what it's worth, I only paid about $300 all-in to get an i3 Intel NUC up and running. Same form factor, but since it's a barebones kit, I was able to add the RAM and SSD of my choosing and I was able to get a powerful, full-featured small PC out of the deal instead of a ChromeOS device. In my case, I just used RAM and SSD left over after a round of laptop upgrading, but it still compares favorably to the $370 Chromebox under discussion in this article. This looks like just the right thing for my wife. Win it, then sell to buy something useful. Few days ago I was struggling on my PS4's browser to make it work the way I wanted it. Unfortunately, it was hard to type using the controller unless you use wired keyboarded. The browser will not allow you to do decent surfing that much and it doesn't support flash. It was then that I thought to get or build a raspberry pi small computer and then Yoo-Hoo glued it on the back of my TV , use wireless keyboard and mouse and call it a happy surfing day. This would get rid of most of the boxes under my TV, each can do one or two things - this looks as though ie will do the lot!